This PR automatically handles the conversion of the src and poster attributes from HTTP to HTTPS to generate valid AMP for the <amp-video> and its subsequent child nodes. Forces by passing true to $this-maybe_enforce_https_src( $value, true ) for both the src and poster attributes. Updates the child node(s) src attribute when it changes through the filtering. Force HTTPS for video poster. Thanks, this PR looks really good, and it works as expected. It forces the <amp-video> srctohttps`. There's just one question below, which might not need a change. Nice tests to ensure HTTPS is forced. This is an edge case. But do you think the poster should be forced to HTTPS like it is here? It looks like HTTP is allowed for poster. 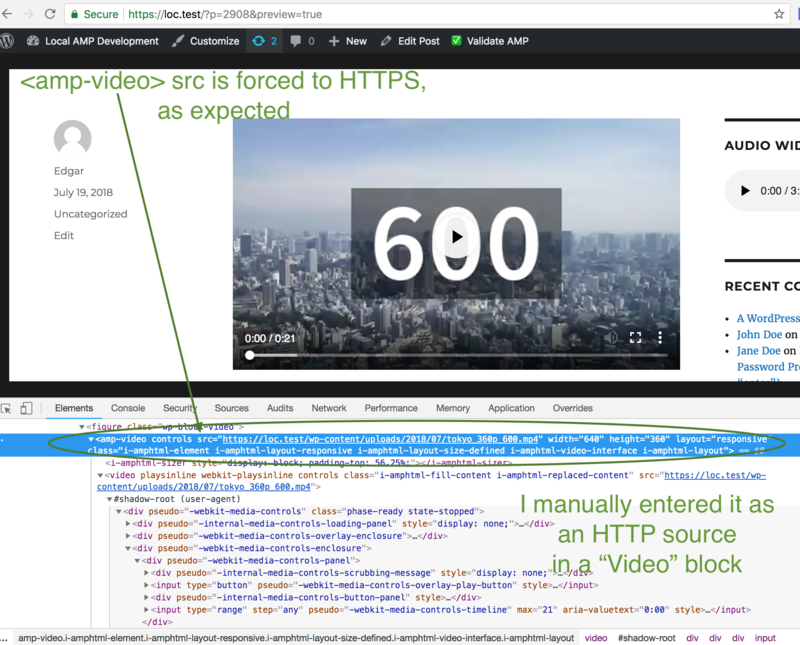 For example, passing this amp-video with an HTTP poster to the AMP Validator results in a valid page. The HTTPS request might fail if we upgrade it from HTTP. But we're already upgrading the src to HTTPS, and that might be on the same domain. So this probably wouldn't be a common issue. Good observation, @kienstra. You're right, it does validate. Therefore, we do not need to force the poster to HTTPS per the edge case you identified. I'll roll that part back. Revert `poster` attribute back to not force HTTPS. 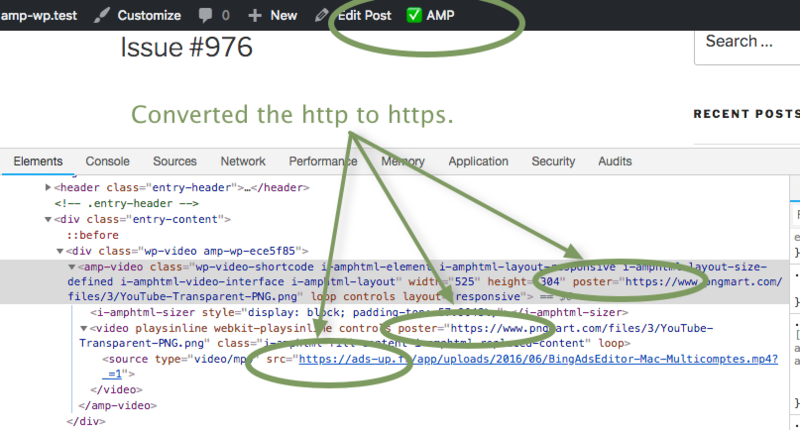 AMP allows HTTP for the `poster` attribute. It is valid AMP. Therefore, in the edge case where the poster's URL is not HTTPS, we do not want to force a failed request. No hurry, but when you have a chance, could you please review this pull request? It looks good, and works as expected. Abstract update src functionality to new method. The task of deciding whether to update and then handling the update is a separate task. By abstracting, we also create a reusable method. Is adding a space for increment/decrement now in coding standards? This is the first I've seen it. @westonruter It's a byproduct of the auto-formatting setup in my PhpStorm style configuration. I'll correct it as it just looks weird. Interestingly enough, it's valid syntax and passes our sniffers too. * @param string $new_src The new src attribute. * @param string $old_src The old src attribute. Not a problem but curious why this logic isn't inlined in the sanitize method? It seems a bit unnecessary to have a new method for this when putting an if statement would do. why this logic isn't inlined in the sanitize method? @westonruter I abstracted to reduce the cognitive load. At first, I had this if code block inline within that method. But as I read down line-by-line in the method, there's quite of bit of tasks going on. Now when reading the method and you get to the $this->update_src(), you understand that it handles updating the src without having to worry about the details. Also, note the pattern in the sanitize method and how it deals with all of the attributes and each node. There is an exception with the layout, which could be abstracted into the set_layout() that first calls the parent and then sets the 'responsive' layout. But other than that, the method works at a bigger level, i.e. all attributes, the node, and its child nodes. Setting the src is a granular task such as setting the layout or video dimensions. @westonruter If you prefer, I can move back to the inline solution and remove the abstracted method. Adjust code style format for consistency.